The last few months of the year are always exciting for me, it means Christmas is around the corner and everyone is in a good mood. 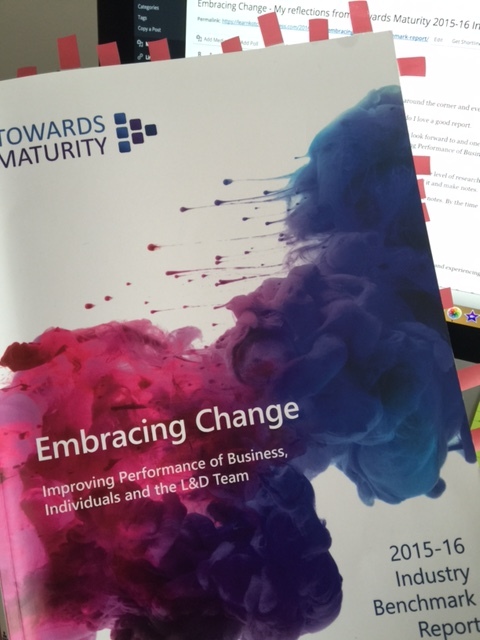 It is also a time of the year when a number of L&D reports are published – and boy I love a good report! I was fortunate enough to read a few during the summer of 2015 but one that I always look forward to and one that continues to deliver and hit the mark is the Towards Maturity Industry Benchmark Report. The 2015-16 report had the title of “Embracing Change – Improving Performance of Business, Individuals and the L&D Team” and it had an associated hashtag #bethebest15 on social media platforms. This is the 13th year of the report and it once again stands out as being the industry leader when it comes to the level of research and data that is captured and analysed. I was fortunate to have a hard copy of the report delivered and thus I started to read it and tweet various sections on my bus rides into work, whilst also making numerous notes. By the time I knew it I had exhausted my post-it flags and had written all over the report. Evey page a winner and every page a point to digest and reflect upon. What does this report tell me about the state of learning and does it resonate with what I am seeing and experiencing? What can I learn from this report and try to adopt and influence in my learning journey? A great start in tackling this report is to make sure you read the brilliant foreword written by 2015 LPI Colin Cordner award winner Dave Buglas. Dave, I sense, is very much like me. He is disillusioned with what he sees in learning and states that “it is disappointing to see L&D professionals are still playing it safe – failing to adopt the new world of work and learning”. The report title clearly is a call to action for L&D and a loud one at that – embrace change it shouts out, take action, look at what is possible to do and not necessarily what you are comfortable in doing! The report has a major focus on the L&D professional as an agent of change – a person who can really make a difference to organisational performance – whether you have that seat at the table or not. This is supported by the new feature added to this year’s report – Call to Action – at the end of each chapter, providing a great summary of the findings and then asking the L&D professional or business leader what they can do to make a difference. The report highlights that learning professionals are “still very conservative in their approach” with a tendency to rely on the technologies they know rather than buck the trend. With cloud-based apps expanding there is a great opportunity to explore additional quality content and video streaming to complement existing learning. Our love affair of eLearning is nauseating – we need to look at other options and invest in digital skills to support this discovery phase. A great tactic deployed in this report is the placing of a crystal ball in front of L&D professionals – it asks the question on what the future of L&D would look like in 5 years time? So the feeling is that L&D will change and it will evolve to a more business aligned function. The concerning part for me is that we are still seeing the over-reliance on technology in moving the L&D function forward. Yes technology can and will play a role but I am still concerned that it is seen as a high priority in this journey. Chapter 2 ends by echoing this call to action – asking L&D to focus on “what is critical to your business..rather than investing in the latest technology fad” – and boy did that bring a tear to my eyes! For me, this is the key ingredient that I keep harping on in my consultancy and discussions. Once we loose focus on the line of sight between L&D and business then we may as well pack up and go home. One of the highlights of the report is it deconstructs the 70:20:10 framework and tries to unpack how L&D professionals are applying this in the workplace. The Top Deck (i.e. organisations that report better results, better staff engagement, better responsiveness to business change and fewer barriers to implementation) have adopted the 70:20:10 model effectively in their organisations with 84% having a blended approach of learning technologies in their formal learning offerings and 71% providing access to job aids online or in the workflow. Proof that 70:20:10, when appropriately applied, can add value to the learning experience and deliver results to the organisation. The call to action in this chapter is to business – lean on your L&D professional leaders to develop the desired learning interventions you require in order to deliver the performance outcomes desired by you. This can be challenging, pending where L&D sits in the overall business. The report looks at this and notes that two-thirds of the L&D functions sit in a centralised HR/ L&D structure. This is not new and, in fact, was the last L&D structure that I had to “battle with” in my role as a Director of Learning at the Australian Public Sector. Although the whole report should be mandatory reading for all L&D professionals, one chapter that should be cherished is Chapter 5. The headline Embrace Change for me comes to the fore in this chapter where the report really challenges L&D professional to rethink their role, dedicate energy and resources to educating the L&D team and calling out for L&D pros to focus on tangible change and not necessarily look to another technological fad as a solution. 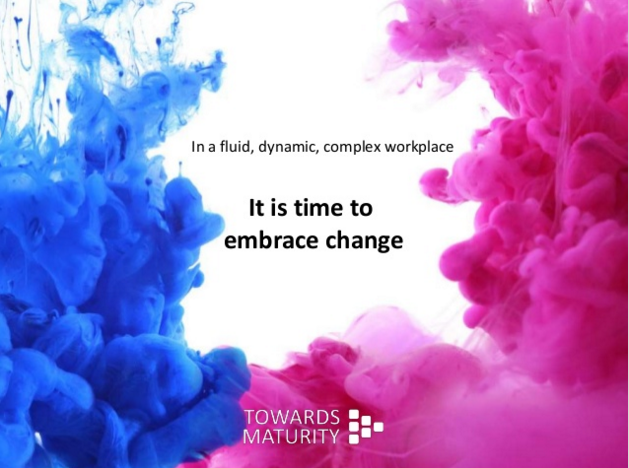 The headline title of the report – Embracing Change – for me comes to the fore in this chapter where the report really challenges L&D professional to rethink their role, dedicate energy and resources to educating themselves and their L&D teams and calling out for L&D professionals to focus on tangible change and not necessarily look to another technological fad as a solution. The chapter starts off by examining how L&D is aligning with business. Although this is widely known and agreed to by most L&D professionals as the most effective approach, it is still remarkable, if not sad, to see that we are not achieving this at a high level. Whilst this is occurring, the Top Deck organisations are continuing to align and deliver for business. They are adopting new and unique benchmarks that allow them to gauge their performance. We can see from these new benchmarks that the Top Deck is firmly focused on delivering for business in an effective and efficient manner. By adopting such benchmarks, the Top Deck are able to not only satisfy current needs and priorities of the business but also position themselves well for the future. It is true that to a certain extent we are in a comfort zone and this report confirms this at various points in its analysis. But how does L&D start to embrace the change required. It is important to “drop” traditional for a more daring and in “your face” approach. The call to action is for L&D to adopt a new role – Consultancy. Undertaking a consultancy approach ensures “programmes support and enhance organisational goals”. Shouting out the business successes allows L&D to be seen as an effective partner in delivering business outcomes. Technology is also seen as an effective tool to turn learning strategy into business reality, with the Top Deck embracing technology to a high level (25% of budget). It is though important to note that the Top Deck do embrace a range of technological solutions and not throw all their eggs in one basket, with a high take up rate for Learning Record Stores (46%) and Moblie Apps (44%). But when it is all said and done, the biggest issue facing L&D in embracing change is whether L&D are equipped to do so. The need to invest in new L&D skills is now more important than ever before. At times I am reminded of the hairdresser analogy – that is they care more about their client’s hair than their own. This, I am afraid, has now crept into L&D. We care and focus more on business learning needs more than our own. Although this is disappointing, I put to these folk the counter argument – why rely on your organisation to provide professional skills training. Yes, it is nice for them to do so and it does alleviate the tangible and personal cost that is associated with learning, but with so much “free” professional training and skills development available it’s time we each took personal responsibility for our development. I was asked the other day, how someone of my vintage is so aware of and uses some many of the learning technologies or social media tools out there – my response – because I take my professional development seriously – you see I have moved passed the fact that I need it to do my job – to me it’s about my ongoing growth. This is echoed by the report when it makes a very startling revelation on Page 68. It has been two years since the “need to develop L&D professionals as change agents” was identified by Towards Maturity and yet we have only seen a rise of 9% in those who take advantage of the many external networks and professional bodies that may help them. For me, my memberships and alignment to professional membership bodies, combined with my extensive networking, is what allows me to continue to develop and enhance my skills. By working out loud every day, I explore and try new apps or approaches, I share and discuss ideas with others and tap into available research and resources. The Institute for Learning Professionals (ILP) is the premier L&D professional membership body in Australia, offering extraordinary value to members as well as tapping into the expertise of its membership base. The range of initiatives (e.g. On the Learning Couch, Growth Cafes) offered free of charge demonstrates their commitment to support the ongoing development of learning professionals in Australia. My Fellow membership with the ILP is my gateway to learning and connecting with like-minded L&D professionals in Australia. My Fellow membership with the Learning and Performance Institute (LPI) and membership of the Association for Talent Development (ATD) allow me to tap into a worldwide knowledge base and expertise, as well as allowing me to access numerous members-only reports and benefits. The LPI Capability Map is an example of a quality developed resource offered by the LPI that allows you to assess your current skills and then compare them against thousands of your peers in learning and development. Whereas the annual State of the Industry Report from ATD is a must read for all L&D professionals as it is ATD’s definitive review of talent development trends. Combined with my monthly #Ozlearn tweet chats and my Personal Learning Network (PLN) via LinkedIn and Twitter, I have all I need as an L&D professional in order to continue to develop and grow. If you look to see how the Top Deck L&D professionals learn what they need to do in order to do their job, it is not surprising to see that networking and professional body membership is their “go to” strategy and very few “leave it up to them”. So when it comes to the development of your professional L&D skills, with respect to JFK, I say: “Ask not what your organisation can do for you but what you can do for yourself”. I enjoyed reading the 2015-16 Towards Maturity Industry Benchmark Report. It is one of the reports I look forward to reading not only to get a sense where I and my profession is at, but also what I should be doing to continue to add value to my clients and/or organisations I work with. The report continues to innovate, by adding new questions and challenges, seeking to continually understand the mindset of the L&D professional and the organisations they work for. To a certain extent we seem to still be talking about the same things. The time for action is here and now. If anything, what this report does do is send a wake-up call to all of us that it is time to Make it Happen! Alignment of learning with business is still a challenge for most L&D professionals – if we are going to be valued by business then we need to align learning with business outcomes and goals. Dare I say it, but maybe it’s time for learning to become accountable for bottom line results. We need to invest in our people – we need to develop new skills and enhance existing ones – this does not always have to be the role of the organisation – we can and should take personal responsibility for our own learning and development.